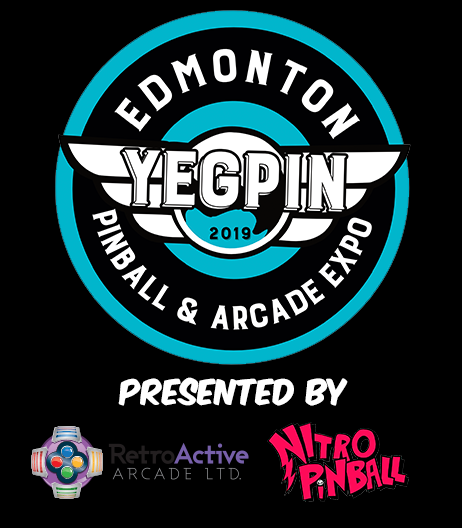 Welcome to the fourth annual YEGPIN – Edmonton Pinball and Arcade Expo which will be held the weekend of April 26-28, 2019. The show has now moved into a new state of the art facility at Millennium Place, 2000 Premier Way, Sherwood Park, AB. The new facility is in a large recreation center that holds a number of large events year round. It has a swimming pool, full workout area, indoor track, skating rinks, full gymnasium and food court area. Sherwood Park which on the outskirts of Edmonton is a booming hamlet with lots of food and entertainment options and the facility is location just off of the Yellowhead highway for easy access. There are tons of free parking at the event and a number of great hotel choices available. YEGPIN is a great show for those whom are interested in playing unlimited pinball and arcade games on our free play floor, buying parts, buying machines or playing in competitive pinball and arcade tournaments. YEGPIN offers an opportunity once in a year to relive your younger days with some of the classic pinball arcade games from your childhood. A chance to play the latest and greatest in pinball and arcade and an opportunity to check out what the resurgence in pinball and arcade is all about. Our new location has the capacity to now hold over 200 pinball machines, classic video games, and other game room goodies that will be set up on free play for everyone to enjoy the entire weekend. YEGPIN will strives to showcase the best pinball and arcade collections in the city and provides you with three fun-filled days of playing pinball machines and arcade games. The event will also be hosting three IFPA (International Flipper Pinball Association) backed pinball tournaments for which you will receive WPPR points (World Pinball Player Rankings). This will be a great, friendly competition that is open to novice and advanced players alike, in which we offer customized trophies and cash prizes to the winners. One of those tournaments is an opportunity for our non-profit show to give back to the community that supports us. On the Friday night we will be putting on the Knockout Cancer Pinball Tournament where all funds raised will be provide back to a charity of our choice. Last year we raised $2,500 for the Alberta Cancer Foundation. As if that weren’t enough, we have a space for a full licensed area, and our games room is open late on Friday and Saturday for special events. For our guests who are volunteers, those that contribute game(s), or advance purchase a VIP all access weekend pass will be invited to a special invite only VIP party where music will be played, food will be served and all free play machines can be played well past midnight on Friday night. Back by popular request, ‘YEGPIN After Dark’ a retro themed Saturday night pinball and arcade party will be open to the public (18+) where the lights go down and the 80’s and 90’s greatest hits are loud! There will also be special rates set up for hotel guests that want to come visit from out of town. See the hotel partners here. Pre-register for the 2019 YEGPIN and receive extra rewards or find out how get in FREE, or win your very own pinball machine when you bring a game! T-shirts, tournament entries, and other merchandise from our vendors will be available for sale at the show. You can find details on the pricing for the event on our tickets page. There will be a silent auction for a chance to buy pinball and game room related items, different groups of merchandise will be put out on the Friday – Sunday with all proceeds going back to support this event. The action packed show will finally wind down on Sunday afternoon. YEGPIN brought people in from all over the country last year and was attended by over 1,500 people last year. Our goal is to have the biggest and best show in Canada!!! Get your tickets and you have an opportunity to experience it first-hand, it’s going to be a great weekend.